Got it as a birthday gift in 1983 and still works like new to this day (2018) Have only got to change the light diodes on the front some years ago. Sound still strong and dynamic with my B&W DM7 mkII loudspeakers, also from 1983. I purchased a 2nd hand L430 from the original owner for less than $200. I gave it's PCB's a good IPA clean up and set the bias current up to specs. I hooked it to a Technics SL1210 TT using a Stanton 681E cartridge and a pair of JBL 4311 monitor speakers. I played Miles Davis's 'Kind of Blue' and immediately noticed this is a 1st class unit. The first thing to notice is the perfect symbiosis between the 4311 and the Luxman. They seem to love each other. The 4311 monitors are kind of hard to drive but the L430 seems to have no problem supplying the required juice. The bass is perfect and not too boomy, yet very present. The highs are noticeable to a very detailed level and the unit seems to have that vintage presence so highly regarded by enthusiasts such as my self. 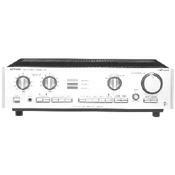 The phono stage is highly accurate especially in comparison with my main Sansui 9090 based system. The L430 provides the option to by pass the tone controls (direct tone control) by a push of a button, thereby playing the source through the pre-amp without any manipulations. It doesn't get any flatter than that. Playing Davis's master piece that way I could not help noticing how accurate the unit is. In fact, the idea of using it as a pre-amp and hooking it to my 9090 was planted right away. This can be achieved by turning the 'process signal only' slide switch on the back of the unit (protected by a safety tab) to the 'on' position. Then you can connect the pre-out of the Luxman to the main-in jacks of any power amp. Needless to say, there is no real need for that. The L430 is more than capable of delivering it's own strength through it's 100 watt per channel power amp. This is remarkable considering the unit only weighs around 13.5Kg. My Sansui 9090, in comparison, delivers 90 watts per channel and weighs more than 22 Kg. The L430 definitely lives up to the Luxman reputation. It's a delight to the eye on the inside (much less on the outside I'm afraid) and it's superior design and choice of quality electronic components is evident. It manages to provide a crisp and clear sound with a wide and deep image stage. Very nice indeed. On the outside, the L430 is not a looker. The metallic bass, treble and function selector knobs are ridiculously over sized and have a funny pointed clowns hat shape. They aren't very comfortable to turn as well. The endless series of push pop buttons on the lower side of the front panel is not well lit and very easy to mistake. Other than the speaker system selectors none have illuminated indicators and it takes quite some time to get used to them. The 'tone-in' switch is counter intuitive and needs to be depressed in order to use the amp's tone control. Other wise, its in the pushed position and the orange display led is lit up, indicating the tone controls have no effect. The 'Phono Straight' switch acts in the same way which is rather confusing. The volume control switch is absurd. It's gigantic, the scale is hardly visible (and in my opinion printed the opposite way around) and the carved 'dot' on the face of it seems to got lost and point at no particular direction. Other than the ridiculous over sizing it's very easy to handle, and for a change a very controllable knob. This is without a doubt a remarkable device. It is a high end TOTL equipment that lives up to the wonderful pre Alpine reputation of the Lux corporation. It's phono stage is remarkably accurate and it produces a very pleasant warm sound with a wide stage and vintage appeal. So, it's not gona win a beauty competition. With this sound - who cares! I purchased the L430 new in 1983 and have not had one serious problem. The phono output is excellent and I still use it. It drives a pair of Klipsch speakers to tolerable sound levels without any clipping. I have had the amp serviced 3 times in 28 years. Still stands up today. Image, soundstage, smoothness, rock solid, phono direct. Pre In/ main Outs for signal processing only. Cannot be used as pre or power amp. I miss my L-430 more than I ever thought possible. Originally purchased new in 1984, the outputs blew two years ago, and I decided not to have them repaired a second time (in 20 years). Time for seperates! Sadly, no combinations that I've tried since have had the same warm, smooth presentation, and laser accurate imaging. The Duo-Beta circuitry really does the job, and though only rated at a hundred per side, this baby was rock solid. Champagne finish is swell, too! If I should venture across one used, for cheap, I will not hesitate.